Fewer women are choosing to have abortions, according to a report by the Guttmacher Institute, a nonprofit organization that has studied abortion rates for more than 30 years. From 1990 to 2005, the total number of abortions in the U.S. fell from 1.6 million to 1.2 million. Despite this drop, the study found that more than 1 in 5 women will have an abortion at some point in her lifetime; however, that rate does not apply equally to all women. 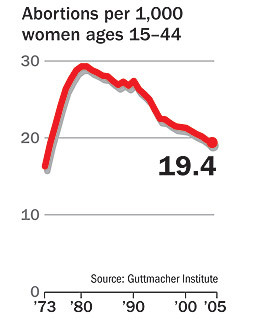 Teenagers and young adults ages 20-24 were responsible for much of the decline, while rates increased for women in their 40s. Race also made a difference. In 2004, only 11 out of every 1,000 white women had abortions, compared with 28 per 1,000 Hispanic women and 50 per 1,000 black women.